Who Gave ‘Auld Lang Syne’ its Words? Its a bit of a philosophical one; but in light of New Year probably appropriate. New beginnings bring new opportunities, new resolutions and new intentions. Today’s life however, can be so overwhelming that we are easily swept off our feet as to how we came this far already and forget all about the roots and preparation it took to put us where we are today in the first place. In Bloodlines -Touch Not the Cat, character David Stewart is inspired by the courage and strength it must have taken his ancestor Alexander to make the move from Scotland in 1896 to the America’s, where he became a correspondent for the Boston Globe. Are it those same writer’s genes that makes David decide to trade in his professional life as ICT account manager for the long cherished dream of becoming a travel writer? In Bloodlines -Traces, we learn even more about Alexander; specifically his quest to save the lives of thousands of soldiers in WW I Gallipoli, which is based on a true story, initiated by no other than Keith Murdoch, father to present day Rupert. Learning about your ancestors, can not only teach you a lot about who you are, it also makes a great time travel trip. While researching our own genealogy ( Tom McKerley and Ingrid Schippers) we bumped into some amazing and revealing facts that shed a whole other light on what it was like in the life-times of our ancestors. The view history books tend to give, can differ dramatically from what our predecessors have to reveal. Connected to family history it can be fun and very (story) telling to research the name of a town or the name of an old profession. One of Tom’s forefathers turned out to be a Journey man. Research into this kind of profession told Tom a whole lot more about his ancestors lifestyle. The history of a saying, a song text, a tradition make great discoveries. 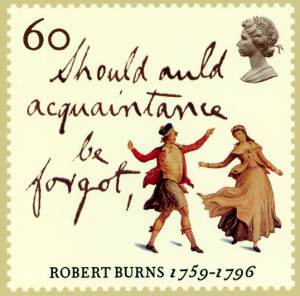 In the case of Auld Lang Syne, it was Robert (Rabbie) Burns who wrote the words. The same Rabbie Burns who was pioneer of the romantic movement; inspirator of socialism and liberalism, cultural icon in Scotland and among the Scottish Diaspora around the world*. Same Rabbie Burns who was born in Ayrshire, on the 25th of January 1795 and for whom Waterstones in Ayrshire is organizing a special event the coming 28th of January; where Thomas McKerley will be, with lots and lots of copies of Bloodlines-Touch Not the Cat and Bloodlines-Traces and some copies of our new project: Scottish Family History Writing. On the 28th of January 2017, starting 11 am, throughout the day, the friendly Waterstones bookseller in Ayr will be hosting an event that has Scotland written all over. Robert Burns, traditional foods and…… Scottish Family History. A Guide to Scottish Family History Writing, with examples of “how to go where and find what” while researching your own genealogy. Come visit Tom in Waterstones Ayr, on the 28th and sample some Scottish traditions….